The new Solana Ranch Park will hold a grand opening ceremony on Friday, March 27, 2015 at 1:30 pm. Join Council President Lightner in this ribbon cutting ceremony at this great new park. Of course, after visiting the new park, you can run across the street to the new PHR Village center to enjoy a Starbucks coffee and shop at the Trader Joe's (which also opens on Friday, March 27!) It'll be a banner day for the Pacific Highlands Ranch community. Solana Ranch Park is nestled between Gonzales Canyon and the Solana Ranch Elementary School in the community of Pacific Highlands Ranch. 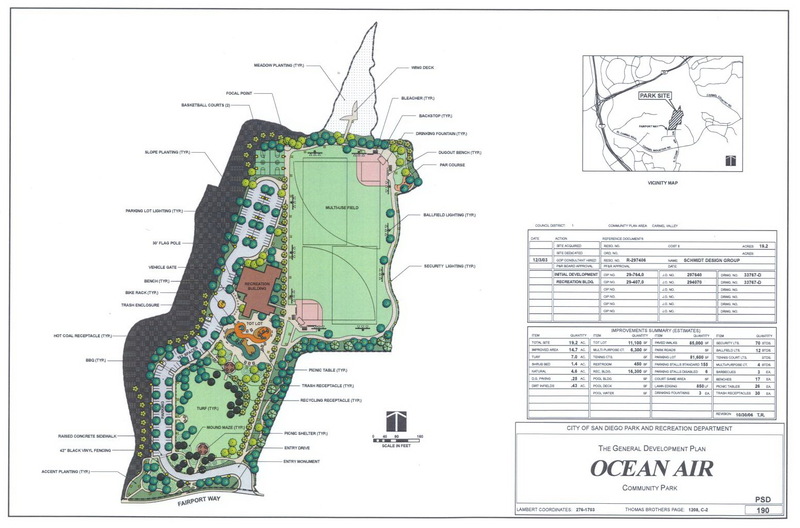 The design for Solana Ranch Park creates a destination for the residents of Pacific Highlands Ranch and embraces the walkable nature of the community. A turf amphitheater offers a flexible space for community events, a half basketball court and children’s play area provide opportunities for play, and interpretive panels tell a story of the park’s connection to nature, the surrounding community and the region’s history. 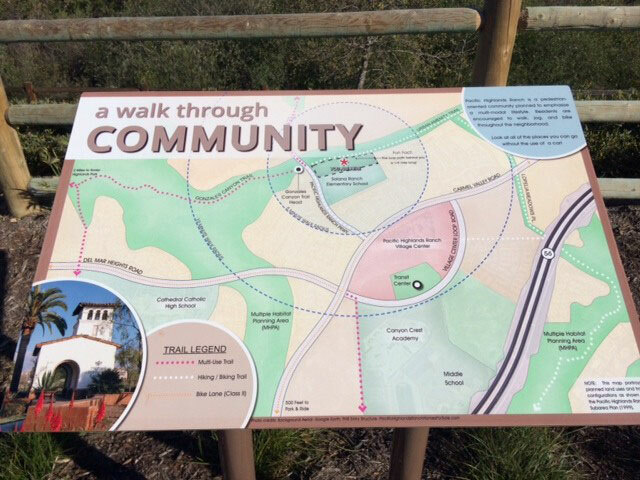 NOTE: The Solana Ranch Park is located next to the new Solana Ranch Elementary School, 13605 Pacific Highlands Ranch Parkway San Diego, CA 92130. UPDATE: Really October 26! 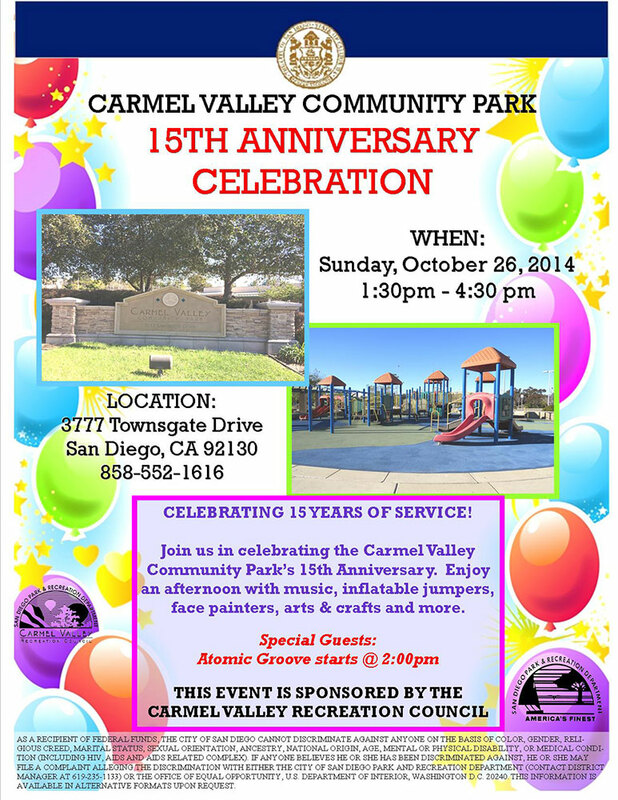 Join the Carmel Valley Recreation Council in a celebration of the 15th anniversary of the Carmel Valley Community Park! The event is on Sunday, October 15, 2014 OCTOBER 26, 2014 from 1:30 to 4:30 PM. Enjoy an afternoon of music, inflatable jumpers, face painters, arts & crafts and more. The band "Atomic Groove" will perform at 2:00 PM. Please join us for this fun community celebration! The park is located at 3777 Townsgate Drive. 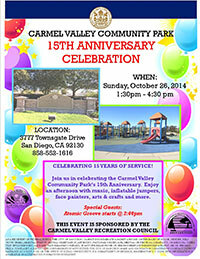 For additional information, call the park staff at 858-552-1616 or view the 15th Anniversary Celebration Flier. Join the Ocean Air Recreation Council! Do you live south of SR-56? Are you looking for a way to volunteer in your community? The Ocean Air Recreation Council works with the City of San Diego to offer courses, camps, programs and events at Ocean Air, Torrey Hills, and Sage Canyon Parks. Events include movies-in-the park, summer celebrations, egg hunts, winter charity support, and SNOW DAY! Be a part of YOUR community and join the Recreation Council the 4th Tuesday of the month, 7 PM at the Ocean Air Recreation Center, 4770 Fairport Way, 92130. Questions? Email us at: oceanairrc@gmail.com. 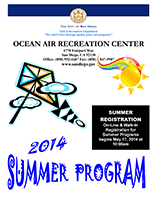 Download the new 2014 Ocean Air Recreation Center Summer Program Brochure and check out all the activities available at the Ocean Air location. Read more about Join the Ocean Air Recreation Council!